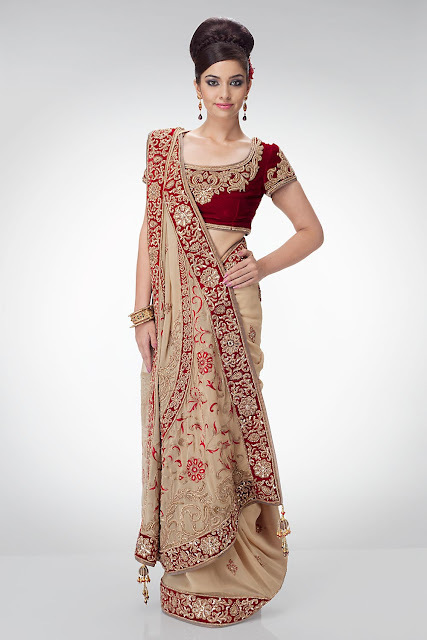 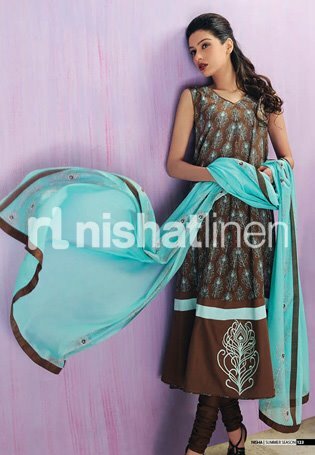 Nishat Group has been a leading business entity in South Asia and manufecturing Quality Fabrics From 1951 and the group has made inroads into the fields of textiles, Nishat Linen specialising in the high-quality production of yarn, greige fabrics, apparel fabrics and retail packed home textiles. 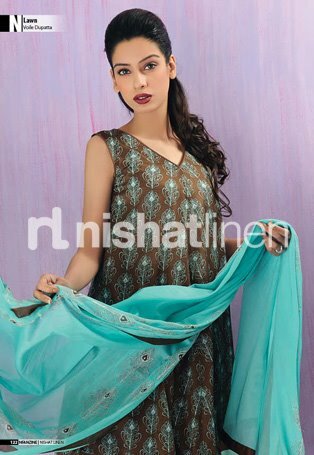 Nishat Mills is now the largest, most modern, vertically-integrated textile mill in Pakistan, comparable to the superlative multinational facilities operating in the country when it comes to management and product quality. 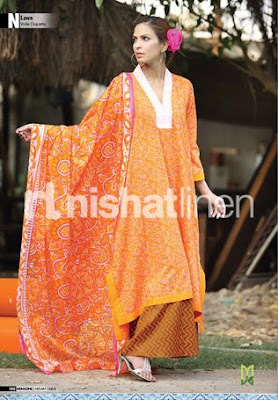 to be in this Era to meet with latest fashion Cuts,Designs and demands Nishat started focusing on designs and Print patterns of fabrics.Now Nishat Dashboard varies with different veriety of fabrics ,designs on Khaddar,Karandi,Linen,Cotton,Lawn etc.Nishat Linen Recently launched Lawn Summer/Spring collection for upcoming summer season 2012-13.All the dresses are Very Pretty and Fashionable and meet of modern fashion prevailing in asian socity.We are sharing some Stunning Designs from Rich Catalouge of Summer -Spring by nishat linen on lawn Fabrics embellished with Tailored work/Stitching Designs on Necklines with Laces,Embroidery and Other decorative stuff.Colorful dresses Prominent color Combination and cuts are according to the trend of Current fashion 2012.This Collection must Attract the ladies and designing Creation make this collection unique .lets have a look on complete Collection of nisha fabrics.